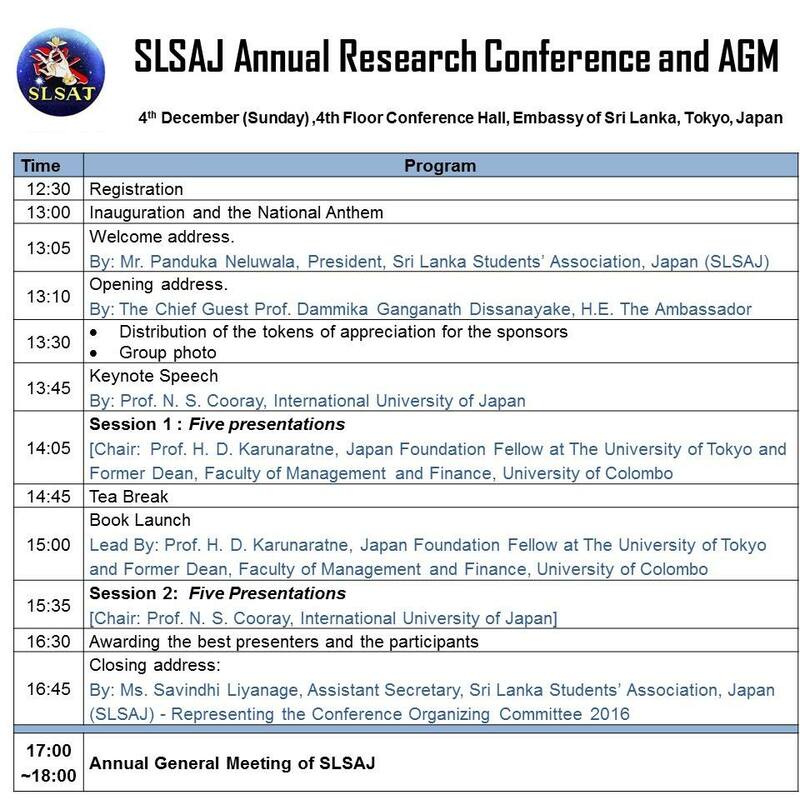 The SLSAJ Research Conference is organized on an annual basis to provide its members an opportunity to present their research findings in front of academics, fellow colleagues, and members of the Sri Lankan community living in Japan. We cordially invite all our members and honorary members to join the conference to disseminate your specialized knowledge and contribute to your respective fields among others. 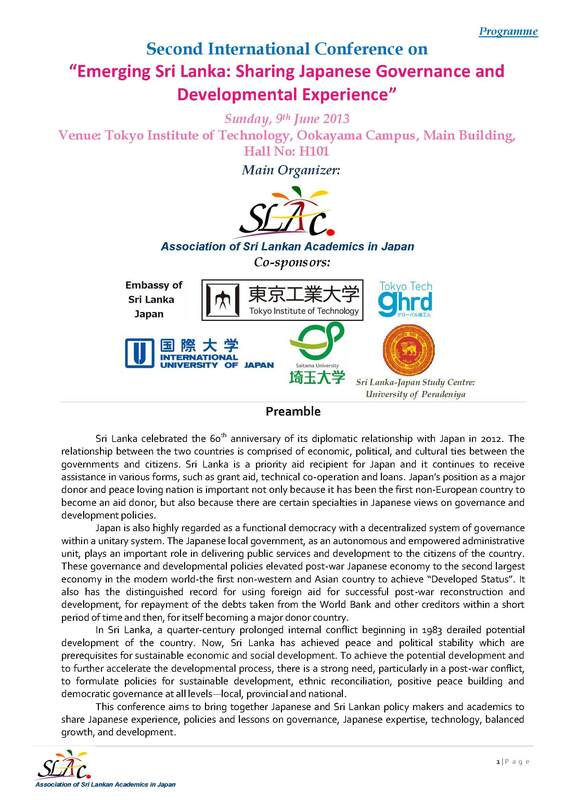 We are pleased to inform you that the Association of Sri Lankan Academics in Japan (SLAc) will hold the 2nd International Conference on Emerging Sri Lanka: Sharing Japanese Governance and Developmental Experience. 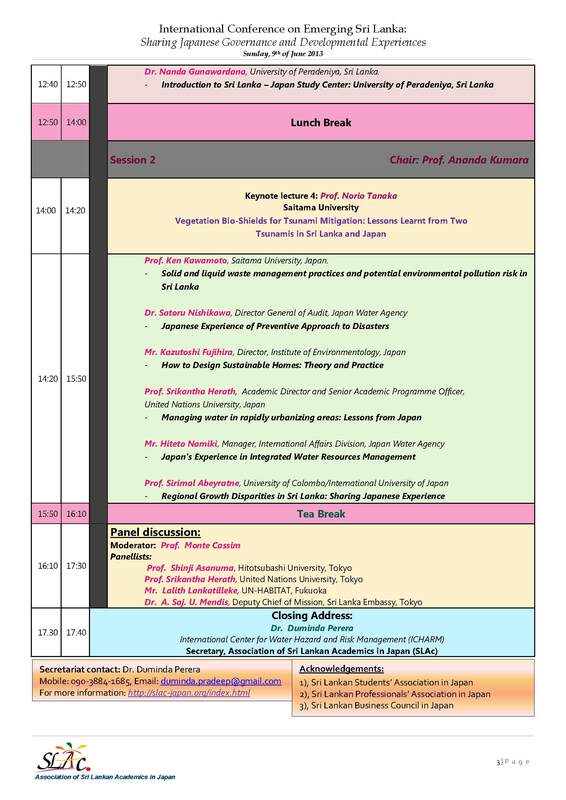 This session will discuss emerging issues regarding Lake Water Management and water education in Sri Lanka and Japan. Through sharing the experience of both countries, this session will aim for a dynamic exchange of opinions from youths regarding the future of water issues. 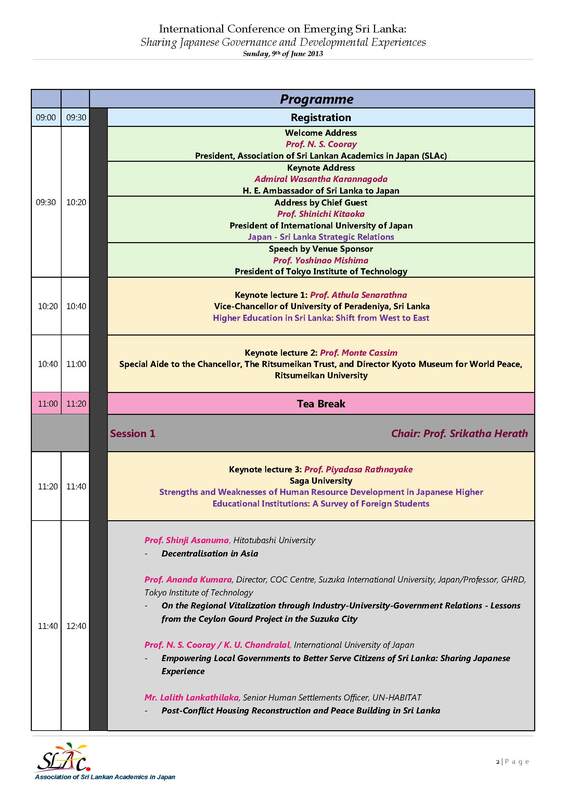 This event will be held as a special session of the “Conference on Sri Lanka – Japan Collaborative Research 2013 (SLJCR-2013, HP： http://www.sljcr2013.iappstat.lk/)” with the support of IWA Japan-YWP, Association for Sri Lanka Student Residents in Japan and Nihon Suido Consultants Co., Ltd and University of Peradeniya. SLJCR-2013 is an official academic conference of University of Peradeniya in Sri Lanka held from Mar.29 to 31. REGISTRATION : Please send an email to matsubara (matubara_k@nissuicon.co.jp) or slsaj secratary (slsajsec@gmail.com) for registration. Please include your (1) Name, (2) Affiliation, (3) Email address and (4) Mobile number. First call of papers for Conference on Sri Lanka – Japan Collaborative Research. Sri Lankan Students’ Association in Japan (SLSAJ). With the understanding on the need to create a platform for further strengthening of the 60-years long bilateral relationship between Japan and Sri Lanka, the Conference on SLJCR 2013 has been organized anticipating to provide an opportunity to discuss the collaborative research between Sri Lanka and Japan since the year 2000. The conference will also carry overviews of progressive research between Sri Lanka and Japan in different disciplines during the past six decades, through special presentations. Please visit the official webpage for more details and abstract submissions. Conference organizers are willing to communicate with the Sri Lankan students and their advisers who are willing to participate for the conference. 2012 will take place in Tokyo, on December 23, 2012. We believe that this conference will provide great occasions for academics having and willing to develop close academic relations with SLSAJ. Experts as well as young researchers in all sectors including government, academic, utilities and industries to gather together for making beneficial presentations and discussions in various fields in a timely manner and actively communicating with the various parties concerned. There will be keynote presentations, oral presentations and poster presentations. Moreover, social gathering allow the participants to exchange information in a relaxed atmosphere. We very much look forward to your participation in the SLSAJ Annual Research Conference 2012. Registration: 5000.00 Japanese Yen for the sponsored participants. Free for the members and invited participants. 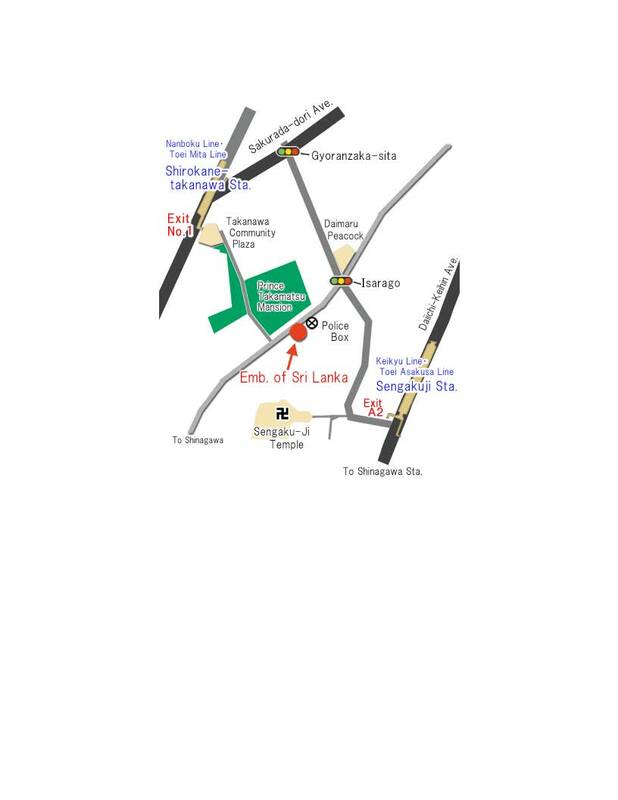 Venue: Embassy of Sri Lanka, 2-1-54 Takanawa, Minato-ku,Tokyo 108-0074.Tel: 03-3440-6918/6911, Fax 03-3440-6914About 8 mints (650 m) walk from Sengakuji station. Please do not hesitate to contact for more information. We are pleased to inform you that the Association of Sri Lankan Academics in Japan (SLAc) will hold the International conference on Emerging Sri Lanka: Prospects for Development and Reconciliation on Sunday, 27th May 2012 at the Conference Room (4th Floor) of the Sri Lanka Embassy, 2-1-54 Takanawa, Minato-ku, Tokyo 108-0074. 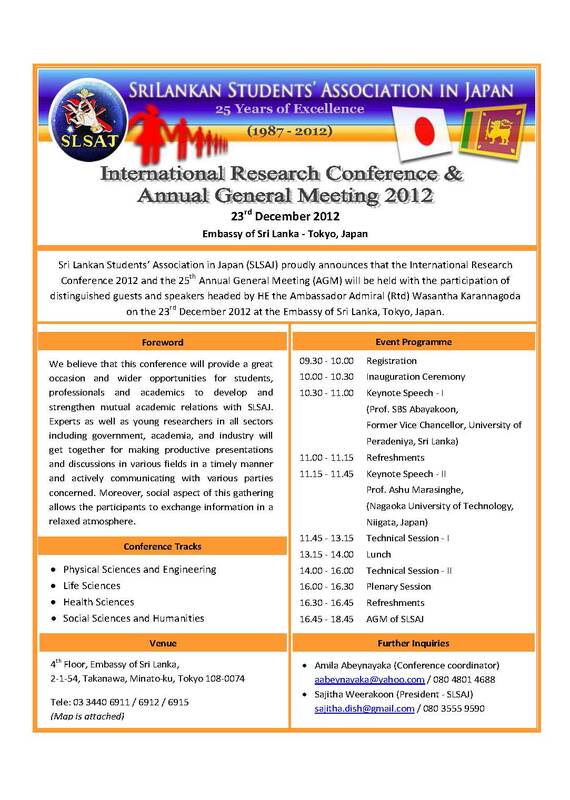 The Sri Lanka Students’ Association in Japan (SLSAJ) Annual Research Conference 2012 will take place in Tokyo, on November 11, 2012. We believe that this conference will provide great occasions for academics having and willing to develop close academic relations with SLSAJ.Experts as well as young researchers in all sectors including government, academic, utilities and industries to gather together for making beneficial presentations and discussions in various fields in a timely manner and actively communicating with the various parties concerned. There will be keynote presentations, oral presentations and poster presentations. Moreover, social gathering allow the participants to exchange information in a relaxed atmosphere.We very much look forward to your participation in the SLSAJ Annual Research Conference 2012. 2011-December-03 Sri Lankan Forum organized by Association of Sri Lankan Academics in Japan. We are pleased to inform you that the Sri Lanka Forum committee will hold its next seminar at 13:45 hrs. on Saturday,3rd December 2011 at the Conference Room (4th Floor) of the Sri Lanka Embassy, 2-1-54 Takanawa, Minato-ku, Tokyo 108-0074. The Sri Lanka Forum and the Embassy of Sri Lanka cordially invite you to attend this Seminar. Please confirm your attendance to Prof. N S Cooray, International University of Japan (Tel: 025-779-1428), Email:cooray@iuj.ac.jp or Ms. Ruwanthi Delpitiya, Counsellor, Sri Lanka Embassy (Tel: 03-3440-6918/6911), Fax 03-3440-6914, email:information@lankaembassy.jp at your earliest convenience. Also please feel free to suggest names, with contact details of those you think who would be interested in the topics, so that we could extend invitations accordingly. Pls refer the below message received from one of our past SLSAJ member regarding a conference on Technology & Management which covers Engineering (Electronic related areas), IT and Management. Pls kindly refer the below message received from him for more details. If you would like to contribute for this by reviewing papers( holding a master degree is sufficient) or publishing papers, pls contact Dr. Pradeep Abegunawardhana (pradeep.a@sliit.lk ) directly. 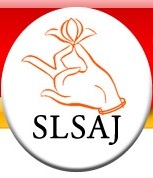 I am a past member of SLSAJ. I studied at Keio University. Please circulate this among SJSAJ Members. This will be the one and only national conference in Sri Lanka which covers Engineering (Electronic related areas), IT and Management. 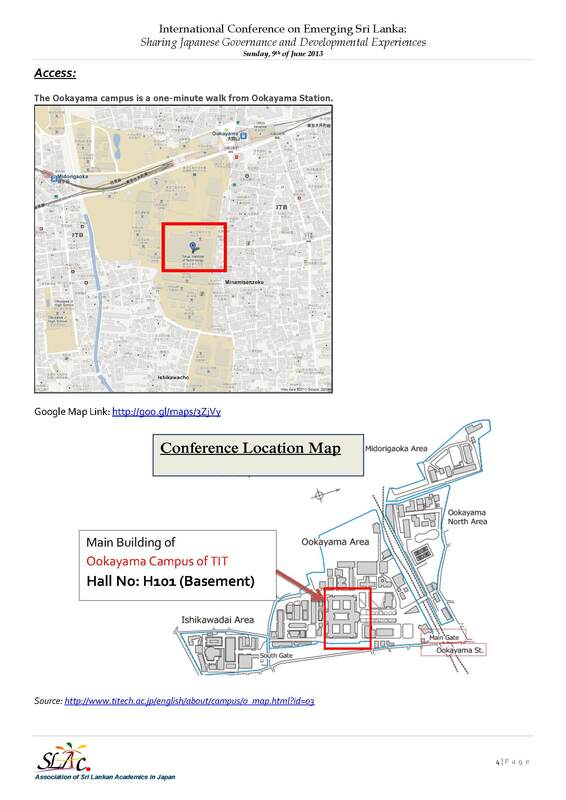 I invite all of you to submit your papers which are under areas related to NCTM 2012. Meantime I would like to invite you to the Program Committee of NCTM. I assure that you will not be asked to review more than 2 papers. I’ll appreciate your prompt response together with the areas of papers if you agree to serve. Your help towards sucess of NCTM 2012 is grately appreciated. of their enrolment in Japanese universities and graduate schools. without having to come to Japan to do so. 400,000 yen is provided upon arrival in Japan. If you have any inquiries, please feel free to contact us by fax or e-mail.